Looking to buy an exercise bike to workout at home? I’m sure you’d probably noticed by now there are a lot of models out there and not forgetting the different types of exercise bikes. There are upright bikes, recumbent bikes and spin bikes. So which one suits your needs best? Upright bikes are, as their name implies, are upright. The seating position is high and allows you to keep your spine straighter and requires less flexibility. If you’re training for the road, this is an endurance fit that resembles your normal riding position. The Schwinn 170 bike looks more like something you would get in a gym and has many of the same features. It is more expensive than the Xterra and Exerpeutic but it offers more for your money. 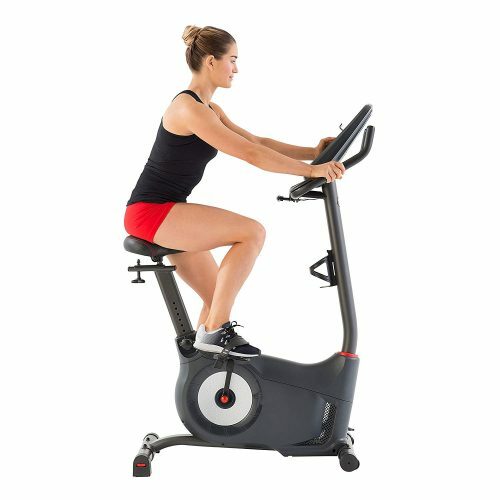 It’s an upright bike with LCD display, heart rate monitor, programmable workouts, 25 levels of resistance and Bluetooth connectivity. This means it can connect to Schwinn workouts or other workout apps for a little extra motivation. Construction is robust and the seat is very comfortable. The upright position is good for beginners, as is the tunable resistance. The ability to use apps to provide workouts or interactivity can help with motivation too. The XTERRA Fitness FB150 is a similar design to the Exerpeutic. It also has an upright position, heart rate pulse grip, LCD display and eight levels of resistance. That display can show distance, speed, time, calories and heart rate which is everything you need really. Build quality is good too, with solid construction, a three-piece crank and comfortable seat. The bike can also be folded away when not in use. 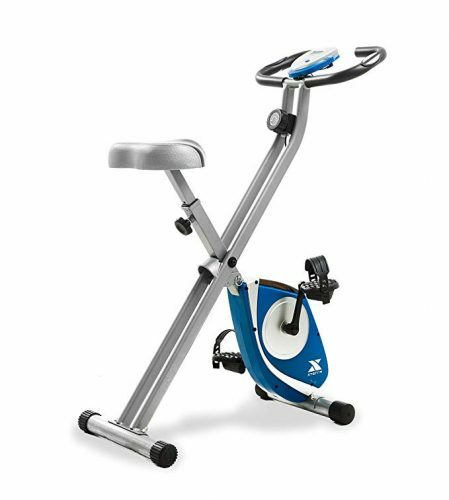 The seat and upright seating position means this exercise bike is also suitable for beginners through to experienced riders. The Exerpeutic folding bike is a great quality upright bike capable of monitoring your heart rate with a hand monitor on the handlebars. It has eight levels of resistance, an LCD display that can show distance, speed, calories and your heart rate. The construction is sturdy and can fold away when not in use. The hand sensors are subtle and accurate enough for home training. With a comfortable seat and that upright position, this bike is suitable for beginners through to more experienced riders. Overall, a good buy for a sensible price. Recumbents have more of a seated riding position so you are more relaxed than on an upright. The Schwinn 230 looks more like a gym exercise bike like its Schwinn 170 upright sibling. It is more expensive but offers more too. It’s a solid exercise bike with adjustable seating, multi-adjustable resistance, built in workouts, MP3 input for motivation, heart rate monitor, USB charger and simple controls. This bike is for those who take their exercise seriously. There are 22 built-in workouts offering a range of challenges, a quite inertia drive system and USB charging for longer sessions. There is also the option to add a sweat mat too which shows its intent! 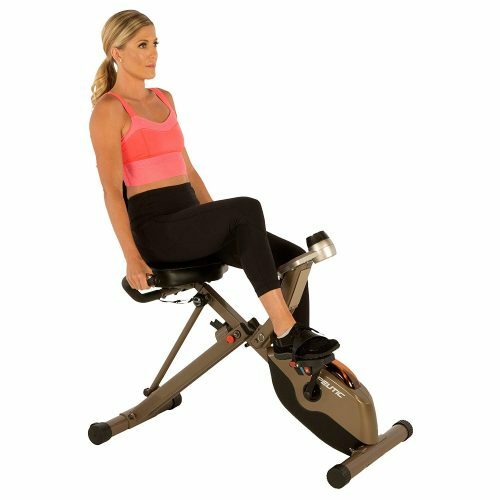 The Exerpeutic Gold 525XLR offers a comfortable seating position that is easy to mount and dismount yet provides the same level of workout as an upright. It has eight workout levels, a large seat with backrest, an LCD display that can display distance, calories, time, speed and heart rate. Construction is solid and is rated at up to 400lbs. The bike folds up to half its size for easy storage and is simple to assemble. Ease of use is definitely a strong point here, which is why it’s in this list. 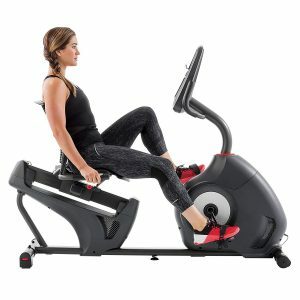 The Marcy Recumbent Exercise Bike with Resistance is more reclined than the Exerpeutic but offers the same level of comfort and quality of design. Also like the Exerpeutic, the Marcy Recumbent is solidly built, has eight levels of resistance, a clear LCD screen that can display time, speed, distance and calories burned. The bike does not have a heart rate monitor which may compromise structured workouts but in terms of operation, it works as well as any exercise bike in this list. It is comfortable, has a smooth pedaling motion and is fast and easy to pack and unpack. Spin bikes are a different beast altogether from upright and recumbent exercise bikes. Designed for high impact sessions rather than hours in the saddle, these have a heavier drive and usually no freewheel to ensure you’re always working! 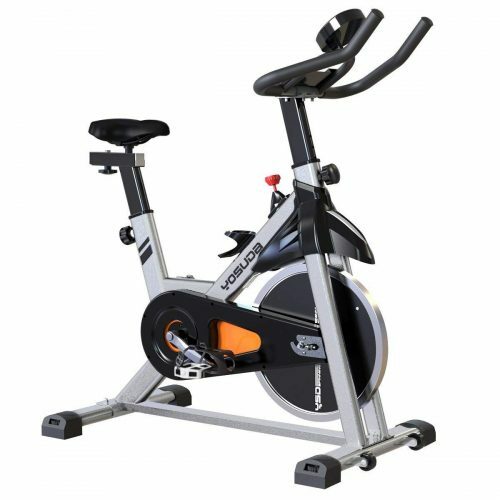 The Bladez Fitness Echelon GS is a perfect example of a spin bike. Upright in nature with the ability to lean forward in the TT position, a heavy (40lb) flywheel to offer decent resistance and a smooth feel and adjustable resistance accessible from the top bar. There is also an LCD monitor that shows speed, time, distance and calories too. Construction is robust, the seat comfortable and the belt drive is quiet. The bike cannot fold up like an upright or recumbent exercise bike but doesn’t take up much space. 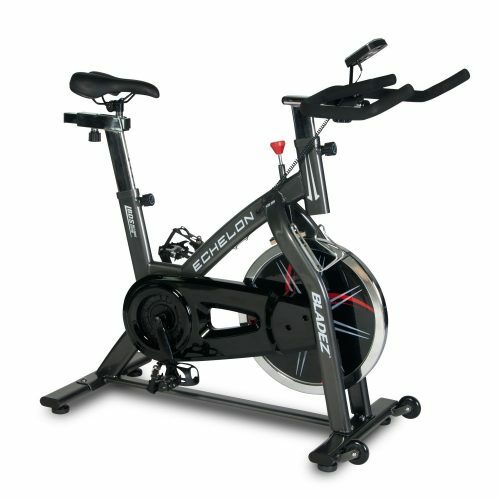 Spin is a very effective way to burn calories and get fit fast and this spin bike is a good way to do it. The YOSUDA spin bike looks similar to the Bladez spin bike but is a different bike altogether. It offers lots of rider adjustment for the perfect fit, continuously adjustable resistance, an LCD monitor to measure speed, distance, calories and time and a bracket to hold a tablet or phone to watch workout videos as you ride. The bike is made from steel and has comfortable contact points. The seat height and position can be adjusted, as can the bars. There is also a bottle holder and a small set of wheels for moving around. With a 35lb flywheel and that adjustable resistance, this is the perfect exercise bike for the home gym! The L NOW spin bike looks very futuristic. 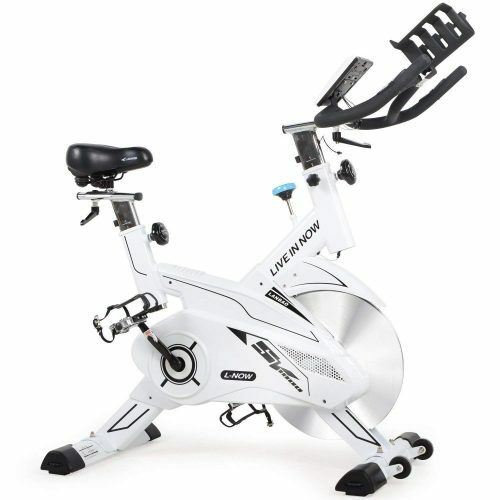 It’s a fully-featured spin bike with solid construction, adjustable seat and bar position, adjustable resistance, a heart rate monitor, 35lbs flywheel, a clear LCD display with speed, distance, calories and heart rate. The bike feels robust and competent and has little touches like microfiber bar tape, a bottle cage, multimedia stand for a tablet or phone and moving wheels. The belt drive is surprisingly quiet and allows you to watch workout videos on your devices without having to turn up the volume. They are all suitable for a home gym and for getting you fit. If you have particular requirements or want to achieve specific goals, one type of exercise bike may suit you better than the others. Each type of exercise bike has its pros and cons and you have to analyze what you’re looking for in order to make the right choice. An upright is a more generalist exercise bike while recumbent is more comfortable and adjustable. Spin bikes are ideal for high impact training. Let’s take a deeper look into each types of exercise bikes. Upright exercise bikes are the most popular configuration. They are the ones you see most at the gym and in home gym ads. They are designed to offer a similar riding position as a real bike and exercises the same muscle groups as a result. 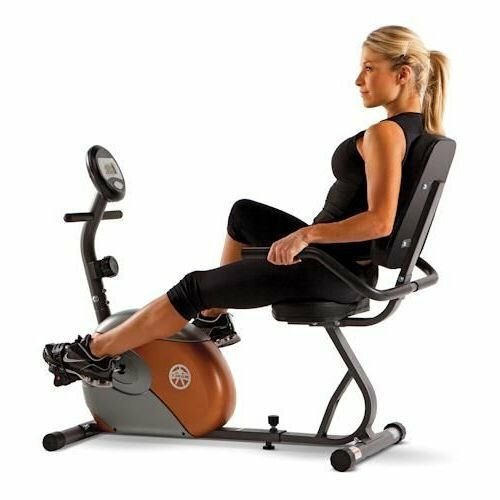 Recumbent exercise bikes are also popular in many gyms and are also popular for home use. They look more gym-like and more solid than upright bikes but they aren’t perfect in all situations. Spin bikes are the final exercise bike type and while more suited to HIIT workouts or faster paced training, can function as a general exercise bike if required. Spin bikes are more popular in gym spin classes than at home though. By now, you should have a pretty good idea of what each exercise bike offers and where its strengths and weaknesses lie. You should also be forming an idea of what type of bike will fit your fitness level, ideal workout type, fitness goal and ability. With that in mind, let us finish with some things to look out for when buying your exercise bike. Exercise bikes can be big and they can be heavy, with some models up to 100+ lbs. You need to bear this in mind if you’re planning to fold it away and store it between workouts. Some bikes lend themselves better to being stored in a closet than others. Some bikes are heavy enough to give you a workout just getting them ready! Recumbent bikes tend to the largest and heaviest. They offset that by feeling the most comfortable and stable. They won’t squeeze into a tight closet but they can fold up a bit and will often come with transport wheels to help. Each has a slightly different feel and level of adjustability. They all come at different price points and will offer benefits in different situations. Magnetic resistance is usually found on more expensive bikes and are often quieter than other types. It is the best type of resistance to have as it is infinitely variable and has a much longer wear time than brake. Fan resistance use a large fan housed where the flywheel is in other types of bike. They are noisy but simple to maintain. They can also provide a cooling breeze while you’re training! Brake resistance, sometimes also referred to as direct contact, uses a flywheel and a brake to provide resistance. The brake pressure can be varied to offer different levels of workout. Resistance can be very adjustable but the moving parts are quite susceptible to wear and tear. Adjustability is key to comfort on the bike. This is especially true if you’re coming back from injury, trying to avoid injury or are trying to regain movement. Essentially, the more adjustment options your bike has, the more opportunity you will have to find that Goldilocks position. The one that is just right. Setting up an exercise bike demands as much time and effort as setting up your road bike. Getting the fit right means better muscle engagement, more comfortable joint movement and the ability to avoid injury for a much longer period of time. Smart functionalities are a value-add option for exercise bikes and can either be essential, or not depending on how you use your bike. A smart function can be as simple as a heart rate monitor or as complicated as Bluetooth and ANT+ connectivity for workouts and games such as Zwift. Smart functions can be useful if you’re going to utilize these functions but can be a waste of money if you’re not. A heart rate monitor is a good function to have as it enables more accurate feedback on calories, effort and fitness. Other smart options are purely that, optional. Exercise bikes are an investment. That doesn’t mean you have to spend hundreds of dollars just to lose a bit of weight or get fit. It very much depends on what you want from your bike and how much you will use it. If you need to get fit to get well or cycle as a way of life, spending more on a fully-featured exercise bike is a good investment. If you’re just starting out or aren’t sure how much you will use it, you might be better off buying a cheaper bike and trading up once you’re hooked.